Entering the village of Winthorpe from the Collingham Road you cannot help but notice the village sign mounted on a pole. 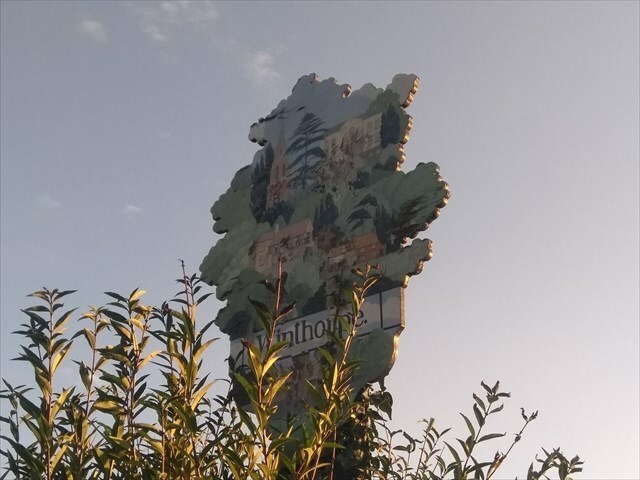 The sign in the shape of a tree was carved in 1983 by Mr. Ian Donaldson of The Spinney, Winthorpe, designed and painted by the late amateur artist Mr. Hugh Clarke (1926-1992) of Gainsborough Road, Winthorpe. The sign made from laminated plywood depicts four important buildings in the village. All Saint's Church, Winthorpe Hall, the Lord Nelson public house and the Almshouses. It replaces a similar sign, painted by another Winthorpe artist Mr. Michael Warren, which was damaged during the winter weather of 1982. In July 1990 Winthorpe entered in The Best Kept Village Competition. Although the village did not come in the first four it was awarded with a Certificate of Merit for an outstanding feature in the village sign. In the words of the notice. Look at the metal village sign. Count the total of both rows of tacks on the white area above and below WINTHORPE. This is A.